Although Elizabeth was still at Greenwich at the time of her mother’s execution, she was soon moved to Hunsdon. Please refer to the blog entries at elizregina.com entitled “Elizabeth: Her Mother’s Memory” https://elizregina.com/2014/01/20/elizabeth-regina-her-mothers-memory/ and “Lady Bryan: An Iron Hand in a Velvet Glove” https://elizregina.com/2014/01/07/lady-bryan-an-iron-hand-in-a-velvet-glove/ for further information about Elizabeth’s childhood at the time of her mother’s arrest and execution. It was while at Hunsdon that Sir John Shelton wrote to Master Secretary Thomas Cromwell, on Wednesday 16 August 1536, assuring him he would follow the King’s orders which stripped Elizabeth of the title Princess and kept her in her chamber. Explanations for this included a story that Queen Jane Seymour slandered Anne and said to the King, “Your Majesty knows how bad Queen Anne was, and it is not fit that her daughter should be the Princess” (Hume 72-73). Many historians believe that Elizabeth was confined to her rooms after her mother’s disgrace because Henry could not bear any mention of her as a reminder of her mother. Others consider that Henry secluded Elizabeth for her own protection against the rumors and stories swirling around Court, a view seemingly supported by French Ambassador Guillaume du Bellay. Du Bellay commented that at a banquet celebrating the marriage of Henry and Jane Seymour, although “Madame Ysabeau is not at that table, the King is very affectionate to her. It is said he loves her much” (Gairdner XI 860). Therefore, under the instructions of her father, Lady Margaret Bryan, Elizabeth’s governess, protected her as much as possible. While Henry was eradicating all trace of Anne by altering, removing or destroying emblems, heraldry, portraits, etc., the Court was avoiding any mention of Anne Boleyn. After her execution Anne’s existence was basically erased. We do not know when or how Elizabeth learned of her mother’s end, therefore, speculation is useless. We do know that after Elizabeth became queen, several chroniclers such as John Foxe were able to tell Anne’s story “at least as he and many of her contemporaries had grasped it at the time” (Zahl 18). When Elizabeth gained the throne and did not immediately defend her mother’s memory, to many onlookers it seemed strange “that during her long and glorious reign, none wrote in vindication of her mother, which officious courtiers are apt to do often, without any good grounds; so that silence was made an argument of her guilt, and that she could not be defended. But perhaps that was an effect of the wisdom of the ministers of that time, who would not suffer so nice a point, upon which the Queen’s legitimation depended, to be brought into dispute” (Burnet 115-116). The conclusion that Elizabeth did not defend Anne as proof of her mother’s guilt ignores the work of John Foxe, George Wyatt and others; although, it is conceded that Elizabeth Regina did stress her paternity. Elizabeth, unlike her sister Mary, never passed legislation to restore her parents’ marriage. Why should she? Henry VIII’s will had placed her in line to the succession as did the Acts of Succession, the latest in 1543; she had gained the throne uncontested in 1558; and, as a political survivor, she realized there was no need to bring to the fore the controversy of her mother’s execution. Elizabeth’s usual maneuverings were to watch and wait—and this was no exception. A pro-active stance trying to prove Anne’s innocence was unnecessary and could prove politically harmful. Alexander Aless, a Scottish theologian and diplomat recalled that Anne’s innocence was demonstrated not only by her character but also by no greater “evident proof than this, that whereas she left you, her only child, your father always acknowledged you as legitimate” and nothing could “persuade the illustrious King that you were not his daughter” (Stevenson 1303:46). John Foxe wrote that Henry VIII in his Last Will and Testament did by name, “accept, and by plain ratification did allow, the succession of his marriage to stand good and lawful” (Foxe V 232). Opposite of the views of Anne’s proponents were those of her detractors such as Nicholas Sander. He deduced that Elizabeth “under the pressure of the fear … that because she was the issue of a marriage condemned by the Church and the sovereign Pontiff, a doubt might be raised touching her birth and her title to the throne” (Sander 241). Sir Thomas Tresham of Rushton described Anne as “the ruin of many pious, worthy and famous men who favoured not that unlawful marriage” (Zahl 13). Perhaps because of a sliver of doubt in her mind, in 1572 Elizabeth had Matthew Parker, Archbishop of Canterbury, track down the papal bull of dispensation from 1528 that had sanctioned her parents’ marriage. Queen Elizabeth wanted to have the document on file in case she needed to prove her legitimacy, beyond any doubt. 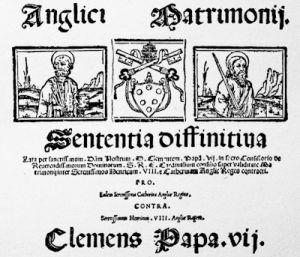 Although this document would not be needed in England, it is assumed by this blogger that Elizabeth Regina wanted to have it for her own marriage negotiations within Catholic Europe. Heading of the Papal Bull concerning the dissolution of Henry VIII marriage to Katherine of Aragon. Not defending her innocence was seen as troubling to contemporaries whereas modern eyes would admire her. Anne’s “faint way of speaking concerning her innocence at last was judged too high a compliment to the King in a dying woman, and shewed more regard to her daughter than to her own honour” (Burnet An Abridgement 115). She “was, it seems, prevailed on, out of regard to her daughter, to make no reflections on the hard measure she met with, nor to say any thing touching the grounds on which sentence passed against her” (Burnet An Abridgement 114). As witnessed in a letter to Queen Elizabeth concerning her mother, Alexander Aless stated that the “Queen exhibited such constancy, patience, and faith towards God that all the spectators, even her enemies…testified and proclaimed her innocence and chastity” (Stevenson 1303:27). Anne’s reputation, written by contemporaries or near contemporaries, was a study of contrast. Was she a pious, Protestant heroine or lecherous woman “following daily her frail and carnal lust”(Gairdner X 876). Defending her in the immediate aftermath of her death was not a politically astute thing to do with her guilt having been ‘proven’ and, yet, defending her during her daughter’s reign invited accusations of sycophantic behavior. Could there be a middle ground? Apparently not, even when a Catholic appeared to take Anne’s side, it was viewed with suspicion. Andre Thevet, a French Franciscan, wrote Universal Cosmography in which he stated he had on good authority from multiple sources “that King Henry at his death, among his other sins, repented in particular of the wrong he had done the queen, in destroying her by a false accusation” (Burnet 268). Considering the monasteries, including the Franciscan Order, had suffered at the hands of Henry VIII and inadvertently Anne Boleyn, the influence of this statement is strengthened. What cause would Thevet have to defend Anne despite her pro-French inclinations? 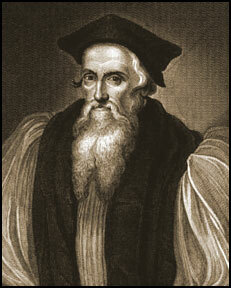 Archbishop of Canterbury Thomas Cranmer must have believed Anne innocent of the deeds and her acquired reputation yet as a pragmatist he realized that when dealing with Henry he had to tread cautiously. The postscript of a letter written to Henry at the time of Anne’s arrest covered both angles “I am exceedingly sorry that such faults can be proved by the Queen, as I heard of their relation. But I am, and ever shall be, your faithful subject” (Burnet 262). Cranmer wanted to preserve the Reformation which in its infancy could not be too closely associated with a blighted leader. With Anne credited for encouraging the Reformation movement in England, her supporters kept her memory alive. 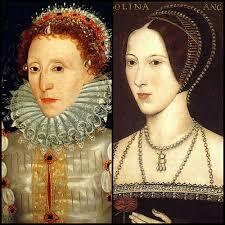 John Foxe referred to her as Godly, “for sundry respects, whatsoever the cause was, or quarrel objected against her. Certain this was, that for the rare and singular gifts of her mind, so well instructed, and given toward God, with such a fervent desire unto the truth and setting forth of sincere religion, joined with like gentleness, modesty, and pity toward all men, there have not many such queens before her borne the crown of England. Principally this one commendation she left behind her, that during her life, the religion of Christ most happily flourished, and had a right prosperous course. Again, what a zealous defender she was of Christ’s gospel all the world doth know…” (Foxe II 407). Bishop John Aylmer, at one time a tutor to Lady Jane Grey, questioned that by banishing Rome from England, was there no “greater feat wrought by any man than this was by a woman?” Alymer was thankful that God had “given Queen Anne favour in the sight of the king” and although he praised many people who were instrumental in promoting the Reformation he felt that “wherefore, that many deserved much praise for helping forward of it, yet the crop and root was the queen, which God had endued with wisdom that she could, and given her the mind that she would, do it” (Cassell 176). Raphael Holinshed praised Anne posthumously in 1577. “Now because I might rather saie much than suffcientlie inough in praise of this noble queene, as well for hir singular wit and other excellent qualities of mind, as also for hir favouring of learned men, zeale of religion, and liberalitie in distributing almes in reliefe of the poore” (Holinshed 797). Even Secretary Cromwell admitted to Spanish Ambassador Eustace Chapuys that Anne had courage and intelligence–“Et sur ce me loucha grandement le sens expert et cueur de la dicte concubine et de son frère” (Friedmann 297). Anne was defended periodically as records of the following years show accounts against persons who maintained that Henry had put her to death unjustly. An example would be proceedings against John Hill of Eysham. On 26 June 1536 it was reported that Hill claimed that Henry had caused Mr. Norris, Mr. Weston, “and the other Queen to be put to death” for “a frawde and a gille” (Gairdner X 1205). In France poems were written in her honour, and in Germany the Protestants expressed strong disapproval of the king’s act” (Friedmann II 300). An anecdote about Christina of Denmark, the Duchess of Milan written by George Constantyne, an Evangelical-eyewitness to many of the events of 1536, to Thomas Cromwell revealed the international view towards Henry. Suspicious that “the kynges majestie was in so little space rydde of the Quenes, that she dare not trust his cownceill, though she durst trust his majestie” although she “suspecteth that her great Aunte was poysoned; that the second was innocentlye put to deeth; And the thred lost for lacke of kepinge in her child bed” (Constantyne 61).